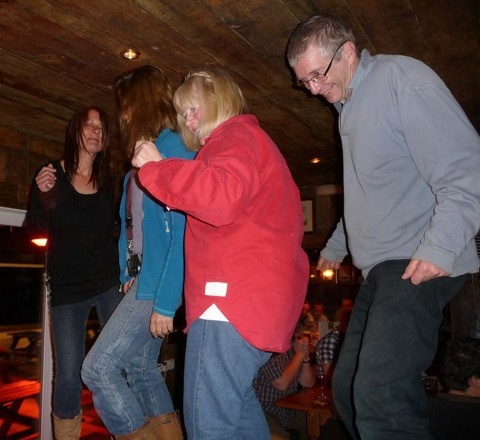 Last week saw the first organised event of the scod year, The Folly Shakedown. The title of the event could not be more appropriate! For myself, my wife Anne, and our beloved scod,`Chinthe`, it all started on friday evening, when we attempted mooring on hardway pontoon, ready to carry out some prep works before the big event the following day. Just to remind you, we were on spring tides, and, at the time we attempted mooring our long keeler on the cross tide pontoon, at the height of the ebb. An hour later and an awful lot of sweating (in both senses of the word) we were moored alongside. We were aware of the fact that there would be very little, or even no water there, but as the nice man said, "she`ll be fine, she`ll just sink into the soft mud, they all do". She didn`t! Instead I watched for a heart wrenching hour and a half, counting down the minutes to low water as we fended off our newly painted hull and adjusting lines as Chinthe slowly but surely started to lay on her side. 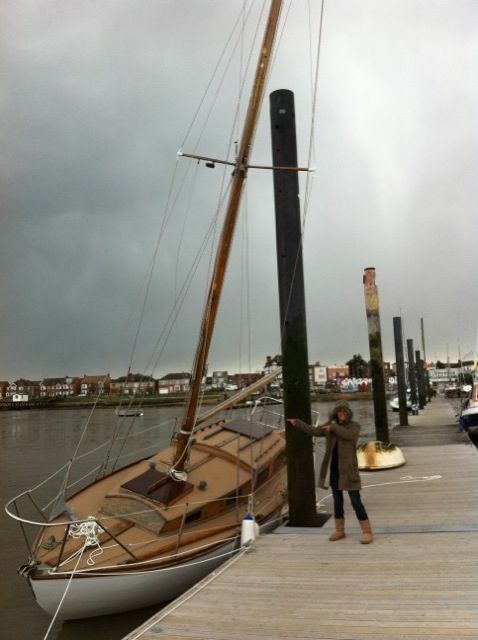 No harm came to her as the mast passed one side of the pontoon pile and the back stay passed the other. I certainly can`t claim that as judgement. An hour or so later she was upright again, and bobbing happily on the water. We decided to leave her put, hoping she may then take to the mud on the next low at about 0400. She didn`t. A bright early start it was. Whilst preparing Chinthe for the long voyage ahead, we got talking to Steve, who was moored opposite. Steve, as it turned out, keeps his yacht at hardway, but has moved to Cowes recently and was looking for a lift for him and his crew. So, off we all went, sailing out through the entrance of Portsmouth harbour, up the inner swashway, and out into the Solent proper. Having not sailed Chinthe since we first bought her, a year and a half ago, we were very pleased of the extra crew as it gusted upto 28 knots! We had a cracking sail over, and only the topping lift shackle as a casualty, when it came undone and failed the float test. We entered the Medina at Cowes and passed class captain, Jaik Tari, taking Stirling out for the first sail of the season. It was here we parted company with Steve and Iggy, As we performed a touch and go on the pontoon, Steve lifted Iggy over the rail and we bid farewell to man and dog. We motored up the Medina, much later than intended, knowing it was now low water, as we dodged the chain ferry performing his usual jaws like approach toward us. As instructed we hailed Dave, the folly berthing master as we passed the no.10 port hand marker. Dave instructed us to stay close to the starboard side pontoons as we made our way up, and someone would come and guide us in, announcing that “we already had one of your party run aground” ( I`m not going to mention names, because Louise already knows who it was!). Not wanting to come to the same fate, we stuck to his instructions to the letter, right up until we came to a nice soft stop. Ray, one of the folly launch operators, came to guide us in. Fellow scod owner, Kevin was onboard and they tried everything to refloat us, turning behind us at speed to create wash was one of the tricks that never fails. Until now! He then kindly tried towing us off. The line snatched, veering his little launch towards the pontoon. To my relief the stern to his boat was still intact, “You didn’t tell me she was over 4 ton” Ray declared, as Chinthe refused to even shudder. To be honest, and in my defence he didn’t ask. When Chinthe doesn’t want to do something she won`t, and she didn’t, even as Dave tried the same tricks with the bigger launch. There was only one thing left to do. We made our lines fast to the pontoon, ten feet away, and went in search of prosecco. Jaik eventually joined the club, when wondering how we were moored mid river, he ran aground behind us. An hour or so later, we returned, with race captain, Mark Taylor, to find Chinthe free from her muddy shackles. We went about taking in lines whilst ferry gliding to the pontoon, thinking that wasn’t too bad as i watched the stern line race off the deck and hear the engine fall silent. We tried Forward, reverse, forward, reverse, to no avail. We cut the line as close to the prop as we could and tried again before admitting defeat. Ray returned and lashed the folly launch alongside, Daves voice was heard on the vhf with instructions to Ray, “Do not let them cut the line”, he could get it off, any bit of line at all and he could do it, we couldn’t, wouldn’t have cut it that close to the prop, the young lady, knows i can do the rope thing, “oh well, they`re nice people anyway”. Ray pulled us astern, vacating the private berth we were occupying and moved us up to the visitor pontoon. We quickly made chinthe off to the pontoon, and, with Mark needing to make a 2200 ferry back to the main land, headed for dinner before the kitchen closed. With my building realisation to the meaning of the word `shakedown` i noticed that Chinthe was sitting rather low in the water. We dropped Mark off to order dinner, and returned to find the bilges full to the boards. All sorts of explanations rushed through my head, Ray offered to tow us to have her taken out of the water, the worst was feared. Then i noticed water dripping from the Gas locker in the cockpit, strange i thought as l opened the locker to find it full to the brim, Above the water line? Whilst pumping her out we realised that she was not taking on water and had only done so during the attempts to move her, too rapidly astern, it would seem, driving water up the self draining pipe to her gas locker. With the bilges dry, our, by now personal pilot, ferried us once more to the folly, where merriments were in full swing. After a bit of a wait, and poor Mark nearly missing his ferry ride back, we all enjoyed a good meal and a glass or two of wine. The band were good and became better as the drink flowed. One by one, despite the early protests, we all ended up dancing on the tables, singing songs that we don’t know the words to. It was a great evening! The following morning, the professional divers that Mark had kindly organised for us, arrived on time at 07.45 as a reminder of the previous evenings mishaps. The rhetorical “you are with seastart?” was followed by “it would have been free i you had been, at least you didn’t do the forward, reverse, forward, reverse thing!” They earned their money that morning. We looked across, jealously, as the wonderful sight of the other three scods in attendance drifted across the Medina to where we had been stranded. Then,One by one, we were treated with the sight of these beautiful, classic, wooden yachts, glide gently past, first Stirling, then Bush Baby, and lastly Simon Bolivar, all full of the character that makes these one design yachts so individual. We slipped our mooring, and, with what there was of the wind coming directly from the west, enjoyed a happy, very uneventful motor back to Portsmouth harbour. 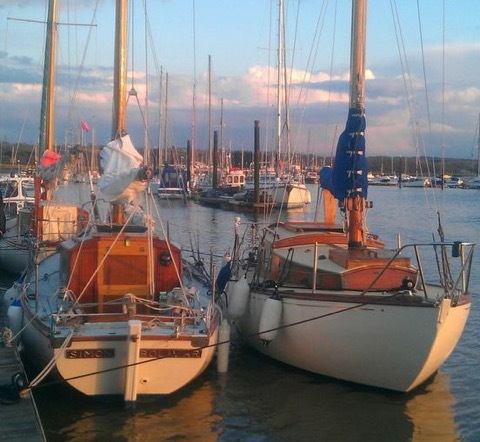 I cant wait for the first full rally at Birdham pool Marina and new Orleans night at Chichester yacht club on 18th May 2013, especially now all the glitches are gone! If you would like to attend, please contact me on soacialsec@scod.org. Thanks to all who attended and made this first rally of the season so special. Thanks also to Dave, Ray and the team, Andy and team at the Folly and MMC divers who were brilliant.